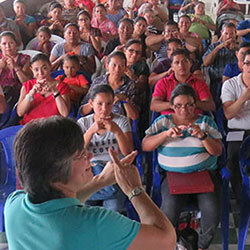 GWM exists to bring the Gospel to the Deaf in Honduras. Our work is primarily in the central region and rural areas. Most of the Deaf children and adults we find have little or no language. After teaching them to communicate, our primary goal is for them to understand what the Bible says. Our desire is they receive Christ as Savior and walk with Him.. Reflecting on our La Paz teachers' class brings a flood of amazement. God causing the Honduran Department of Education to require dozens and dozens of public school teachers to attend our class, well, that amazes me. Check out our "New & Improved" Facebook page. Hopefully you'll "like" us. Our new YouTube channel, here you can watch all our videos. Please click the "Subscribe" button. Mike and Martha Rudd have devoted their lives to helping Deaf children understand who God is, and how much God loves them.